A YOUNG wheelchair user says he is being made to feel “inadequate” after being left stranded by up to five buses a day. Daniel Brabazon, from Plympton, is demanding Citybus improves disabled access to its vehicles. The 23-year-old, who is paralysed from the waist down, is regularly denied access to the company’s city centre to Derriford Hospital services. He has complained that they rarely boast a wheelchair ramp – and drivers are not allowed to help users board. The Herald accompanied him on his journey to work, which begins at 10.20am from a bus stop near his home. A friendly driver helped Daniel up a manual lift-down wheelchair ramp and onto the number 22 Citybus service to Royal Parade. But a quick connection there was impossible when the number 28 he needed to catch arrived without any ramp facility. Daniel said he faced the same problem with the 42 and 28/A services, both also destined for Derriford Hospital, on a daily basis. The ‘low rider’ vehicles, designed to lower to kerb-height so wheelchair users can simply roll on and off, are useless where kerbs are not raised. As is often the case this story has raised plenty of comments with quite a discussion on the old wheelchair v pram argument. I don't know if there is any difference between First Group and Citybus policy in this area but many buses do have notices saying that wheelchair users have priority but I have seen arguments when the mothers have refused to move, stating that they were their first, they have paid their fare and they have just as much right to travel on the bus as anyone else. The vast majority of passengers will do their best to move and do what ever is needed to accommodate wheelchair users but its not always possible to make room. I have also witnessed one occasion when a wheelchair user gave a driver a mouthful of abuse when the driver stopped but explained he had no room (he had a full standing load). He offered to radio back to ask the next bus to watch out for him and try and keep some room. Apparently the two previous buses had just driven straight past so you could understand the passengers frustration but that was still no excuse for the tirade of abuse he gave to the one driver who did stop. It does highlight that at the end of the day, whatever policy is put in place by ‘head office; its the driver who takes the brunt when passengers dont like it. On a totally unrelated issue I notice that the less than brilliant real time display system that is in place on a few lucky bus stops seems to have given up the ghost. Certainly all the bus stops I have noticed this last few days the display has just been the current date and time. Apparently some just tell you to look up the bus timetables! This system has never really fulfilled all the promises made of it, and was never installed at enough bus stops. Have they just now given up on it all together or is it just at temporary blip? Obviously I was not a witness to this situation and have no knowledge as to the exact level of abuse given by this particular customer to the driver. I think in such a situation a lot of people would feel very frustrated and badly let down, which must be made all the worse when you are less independent than many other people. No I cannot condone the person for being rude to the driver (this is unacceptable) but that must not have been a pleasant situation for them to have found themselves in. It would be made all the worse if it is a regular occurrence for them. Unfortunately this is again an example of the Herald looking to sell its trashy rag by sensationalising a story. The gentleman involved has a concessionary travel pass and so is not restricted to which operator he uses. I understand that he travels from Plympton on a PCB service 22 and then needs to get to the B&Q on Tavistock Road. Surely then he leaves the 22 on Royal Parade and go one or two bus stops up Royal Parade and boards the George Junction P&R service which stops at Windsor House (for B&Q). Perhaps if the gent had asked the operators to provide a journey solution for him before he started to travel all of this could have been avoided. There seems to be a failure of logic here. If the bus has a manual ramp, and the driver is not able to help, how is the wheelchair user supposed to board unaided? OK, if the bus can park with only a minimal gap to the kerb, and the platform is exactly the same level as the kerb - but those are two big 'ifs'. One might ask why the company bothers to fit the ramps. A powered lift would in practice be a better solution for wheelchair users - it should be possible to set it at exactly the level of the kerb, or lower it to the ground if there is no pavement - and then raise it to the level of a (preferably) flat floor. This would avoid the inclines which can be a problem for some wheelchair users. It would also mean that the general level of the floor in the bus could be higher, which has certain advantages. Alternatively low floor buses could also have such lifts - I have come across such installations on a Mercedes O405G in Heidelberg, and my wife (who is a wheelchair user) used it to advantage to board at a stop where there was no pavement. I read about that yesterday; if he needs to get to the Tavistock Road B & Q, correct me if I'm wrong, but surely the 40/41/42/44/44A all stop there? The 40 and 41 are a mix of Enviros and R-reg Darts, so it's about a 50/50 chance of it being an R-reg Dart or an Enviro, the 42 during the week is nearly always an N/R/S-reg Dart, so the 44/A may be his best bet, as these are handled by newer SPDs (T/X/Y/51-reg, similar to 50/61/62). On your note at the bottom about the Real Time displays, they all seem to have been 'cancelled'! A Citybus driver got off at Crownhill Low Level today to get a 34 to Milehouse, and he was less than impressed with the real-time display. All of these display the date and time, and then says: 'Please refer to timetable'. I get on wiht this driver very well and had a good chat to him at Crownhill today, he thinks it could be a fault with the system that updates them, but they could well be cancelled altogether, which at Crownhill isn't exactly what you want as 8 City Centre buses all came at once. Also, it will almost certainly be the end of the ex-Trent Volvo B10M Student Link buses in July; ALL SCHOOL BUSES ARE TO BE WITHDRAWN. The contract school buses to Yelverton/Tavistock/Cornwall etc (120/1/2/4/6/7/8/9) will stay; presumably all being operated by B7s. I actually find this story hard to believe, as a driver for first, we encounter the same bus stops as citybus and we have the same(ish) kind of low floor buses. if the kerb is not raised it just means the foldout ramp is a bit steeper, i think in this case the young man maybe can't get on and off the bus himself in which case i'd say he needs someone with him, for health and saftey reasons. The raised kerbs are not the bus companies responsibility but the councils. and there is a limit to how much a bus can kneel due to the suspension!! does this guy expect a bus to kneel right down flush with the ground??? 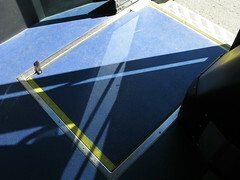 Quite a few of the older buses have low floors but do not have the manual fold out ramps. These are the buses that are out on the 28/A service. Perhaps the problem lies with the PCB drivers and whether they are required to leave their cab to deploy the manual ramp. When i was a driver for Wilts and Dorset, when a bus could not be positioned accurately against a raised kerb to give flat access, we were required to leave the cab and deploy the ramp, but not to assist in pushing a wheelchair, simply waiting for passengers to get themselves on board then replacing the ramp behind them and returning to the cab.